After AT&T, Verizon has started rolling out the latest security patch i.e. 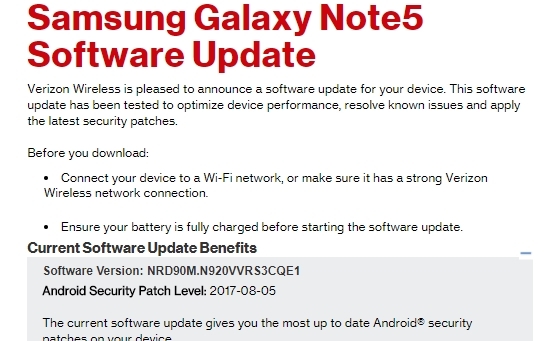 the August patch to Samsung devices via OTA. This security patch adds an added layer of protection by safeguarding your Samsung devices from viruses and other threats. The update also includes various other under-the-hood performance improvements as well as other minor system enhancements too. It is advisable to connect to a good Wi-Fi network before downloading the update and keep your handset charged as high as 50 percent. However, before installing the update ensure that your Samsung handset is at least 50 percent charged and connected to a WiFi network to avoid extra data charges. Meanwhile, Android Oreo is out now. It brings features such as Picture In Picture mode, snooze notifications, revamped settings and other things. You can check all Android Oreo features here and the devices that will receive Oreo update here.